Paula Hyman will be contributing columns to DCI.org each Wednesday. Here's her fourth installment. Show days are very special to me -- only because we practice less than we would on a full rehearsal day. Just kidding, they are special to me, but rehearsing less isn't the reason why. The development of the corps and show is a yearlong process that starts in November and doesn't come to a close until August. Performing our show for audiences across the country is our way of showing everyone all the hard work we put in and how we can accomplish things that most would think are impossible. You only get to perform the show so many times, so every time we go out there, it's "one time before the last time," as some girl put it on this year's PBS broadcast. Performing the show is incredible. It's fun to do in rehearsal but when you actually have an audience out there reacting to what you're doing on the field, it's a feeling like no other. On a typical show day we might wake up anywhere from 7 a.m. to 8:30 a.m., but I'd say the average is 7:30 a.m. We'll eat a little breakfast and head out to marching for a few hours. After that we might grab a quick lunch and then split into sectionals. Food coma always sets in during horn arc. I don't know if I've mentioned food coma yet in any other articles, so if I have -- sorry. Food coma happens right after you eat lunch. You suddenly feel tired and realize that a nap is just what you need -- but you're not going to get one. The more you eat at lunch, the more severe your food coma will be. Let's say we are having hamburgers for lunch. We are super hungry after marching block, so everyone's first instinct is to grab two burgers. I have learned to resist and only eat one burger to avoid an extremely intense food coma. You have to make sacrifices sometimes but it all pays off in the end -- or stops you from falling completely asleep while standing up in horn arc. 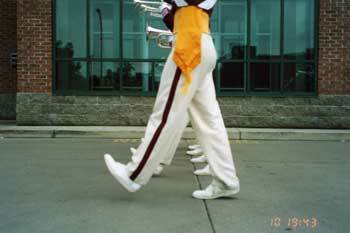 During sectionals we'll warm up and probably work on a couple of excerpts standing in the arc. Then we might break into smaller sections (high brass/low brass or individual sections) to clean up some stuff. Sometimes after warmup we spend the rest of the block moving and playing in the drill. It just depends on the day. After sectionals we'll go to straight to ensemble, which is where all three sections come together to make the big picture. We'll have ensemble anywhere from 1 hour and 15 minutes (really short block) to 2 hours and 45 minutes (that usually doesn't happen on a show day, but anything is possible). We might do a run-through of the show at the end of ensemble but we usually don't if it is a show day. However, anything is subject to change. After ensemble we'll have an average of an hour and a half to get ready for the show. In this time you have to eat, clean your shoes, polish your horn, get your uniform off of the truck, shower, and, if we are leaving the housing site that night, pack up all of your stuff and get it out of the gym and outside of the bus. That is a lot of stuff to do with not a lot of time to do it. Every day I would wake up a half hour to an hour early so I could pack up all my stuff and bring it out to the bus, clean my shoes/horn, and get everything ready for the day before breakfast. It was a great system. All I had to do was grab my uniform off the truck (which I would try and do during lunch) and I was all set with plenty of time to eat, shower and relax. It takes the horn line girls longer to get ready than the guys, since we have to do show hair. When everyone is in uniform, no one should be able to tell if that person is a guy or a girl. We put our hair in a tight bun and use tons of gel/hairspray/hair gel and clips. Whatever works to make it look perfect and keep it that way after doing the show and taking your shako on and off. It's an art form. The bus ride to the show is always a good time. If we have a long ride, you might fall asleep. As we approach the stadium, someone from the front of the bus will yell "STADIUM LIGHTS" which is our cue to get into uniform. Sometimes the front of the bus lies and it's not cool, but most of the time they yell it at the appropriate time. Whenever you are walking around in uniform, you must have be in twos. That's just the way it is with the Cadets. We get off the bus and line up in twos. Many people have "perma-twos," which means they keep the same two all summer. Next we'll walk to our warmup site. All of the sections will go their separate ways. The brass line will either set the arc and put our shakos and jackets down in front of us, or line them up in sections along the curb and then go to visual warmup. This picture is of the prestigious front line. Mikey, Jason, Adrian, Michael, and yeah, that's me on the end. A huge thank you to Jodi for taking that picture -- it's an awesome shot. So after visual warm up, the brass line will warm-up in the arc. We'll play some exercises, chords, and a few show excerpts before heading out to the gate. The walk to the gate in twos is our time to focus on what we're about to do. Each section has its own way of getting ready. Our color guard, for example, sings all kinds of songs on the way to gate; it's their way of getting prepared. Hey, whatever works for them is cool with me. The brass and drums are silent all the way down. While waiting for the corps before us to finish up, we hug and tap buckles, wishing each other a good show and all that stuff. A lot of us develop certain rituals with certain people. It's sort of a routine at the gate every night. When George whistles, we all bring it in. He talks to us for a bit and then we sing the corps song. It is time to go out and do the show. We perform the show and it's the most incredible feeling. We throw down and people go nuts for us -- it's a great time. After the show we have retreat, which is where all the performing corps come out onto the field and scores are announced. We don't really care about the scores -- our main goal is to entertain the people and to be excellent. The opinion of eight guys in green shirts isn't going to determine whether we had a good show or not. If we "win" we do an encore (which is so much fun) and if we don't, we go back to the busses. You usually trade off with your seat partner for who goes on the bus and gets out of uniform first since the bus isn't one of the roomiest places for 50 kids to get changed on. So one person will go to the truck, put theirs and their seat partners' shako and plumes away, and practice a little while the other person gets changed on the bus. The bus probably gets up to 100 degrees inside. It's pretty gross how sweaty we get after the show. All you want to do is get out of your uniform so you can stop sweating but you end up sweating more trying to get it off. It's awesome. I always seem to misplace one of my sandals or my shorts or something, which prohibits me from getting off of the bus right away, but I eventually find whatever it is I am missing. After we practice for a little bit, we usually just walk around the show site and grab something to eat off of the food truck -- UNLESS there is a fast food restaurant or gas station within walking or running distance. It's tough to make it to the front of the line at McDonald's when there are a billion other corps kids in there all wanting McFlurrys just like you, but it's worth a try. If you have friends in other corps, after the show is one of the only times you'll get to see them so it's a great opportunity to catch up. You might also have friends or family who came to watch the show -- it's always great to see your family on tour. There are drum corps people everywhere. Drummers are all over the place, drumming of course. Guard members and spinning and throwing stuff in the air, and horns are scattered about playing licks from the show. It's a cool vibe seeing all these tan people that are just like you. Then you get on the bus and you leave for your next destination, getting ready to do it all again the next day. Paula Hyman is a fourth-year member of the Cadets where she is the mellophone section leader. She is 20 years old and currently single. Originally from South Florida, Paula recently made the move to Allentown, Pa., to work for YEA!, the umbrella organization of the Cadets, Crossmen and the U.S. Scholastic Band Association. She ages out in 2006.